Organic kitchen waste constitutes a separate fraction of municipal waste with the classification number 20 01 08. The management of such waste is determined in the Rules on the management of organic kitchen waste (Official Gazette of the Republic of Slovenia, no. 37/04). In accordance with the Rules, organic kitchen waste is divided into waste generated in the catering industry and household waste. - To separate and biologically process all organic waste. - To implement separate collection of organic kitchen waste in the food service activities. - To ensure composting of household organic kitchen waste in small-scale municipal composting systems at least in districts with more than 500 inhabitants and a population density above 10 inhabitants per 1 ha. Management of organic kitchen waste is determined in the Rules on the management of organic kitchen waste (Official Gazette of the Republic of Slovenia, no. 37/04; hereinafter: the Rules). The purpose of the Rules is to optimize the separation of organic kitchen waste from municipal waste and define its recovery. A generator of organic kitchen waste in the food service activities is defined as a food business operator running a kitchen where on average 20 or more meals per day are prepared. Regardless of where the meals are distributed, the generator of organic kitchen waste in the food service activities must collect all organic kitchen waste generated during food preparation as well as any leftovers separately from other waste. Organic kitchen waste must be delivered to a collector or directly to the recovery facility. Collection and recovery of organic kitchen waste may only be carried out by holders of required permits issued by the Ministry. In accordance with provisions in Rules, generators of household organic kitchen waste must have their waste collected by public services, deliver it to an operator of a small-scale municipal composting system or compost the waste themselves in a home-composting system. Waste generators are also required to comply with the regulation on animal by-products, which classifies organic kitchen waste as category 3 waste. The regulation determines the rules of collection, transport, storage, handling, recovery and use or disposal of animal by-products in order to prevent these products from endangering the health of humans or animals. The main purpose of the regulation is to prevent animal by-products from entering the food chain. Furthermore, the regulation determines further handling of organic kitchen waste; most commonly, this involves composting or recovery at a biogas plant. As per the provisions in the Rules, the collectors who obtained their collection permits in 2004 submitted their first reports in 2005. 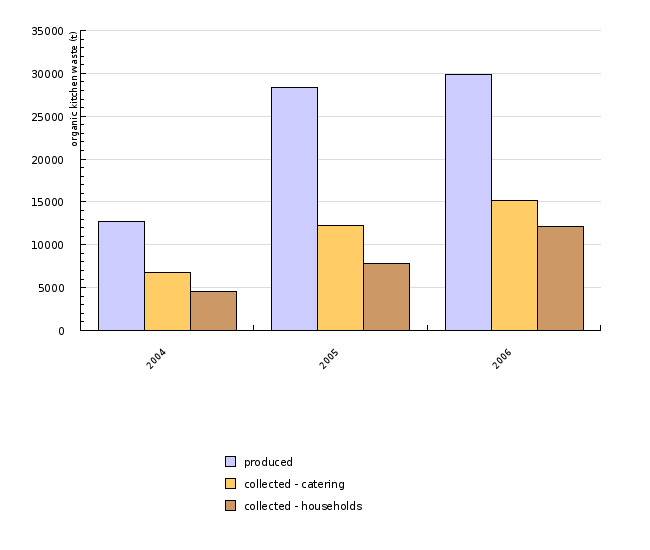 Data obtained by the Environmental Agency of the Republic of Slovenia indicate that the quantity of organic kitchen waste increased significantly in 2005 relative to 2004. The increase in quantities of generated waste resulted in the rise in recovered organic kitchen waste. Composting is the most prevalent method of recovery. The Environmental Agency of the Republic of Slovenia has found that the previous years lacked any system of separate collection of such waste. The majority of organic kitchen waste ended up in mixed municipal waste and was landfilled accordingly. Data obtained by the Environmental Agency of the Republic of Slovenia indicate that in the past two years the quantity of organic kitchen waste has increased relative to 2004, which may be attributed to the adoption of Rules on the management of organic kitchen waste. There are no major discrepancies between the quantities of organic kitchen waste generated in 2004 and 2005. In accordance with the Rules on the management of organic kitchen waste, holders of appropriate permits collect organic kitchen waste from generators in the catering industry. However, an increase in organic kitchen waste was noted both in the catering industry as well as households. 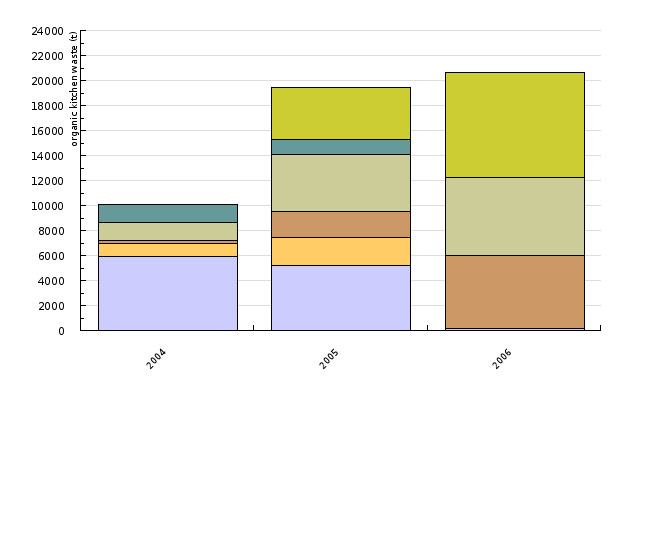 Nevertheless, the total quantity of waste collected in 2006 was slightly lower than in 2005. Composting of organic kitchen waste as one of the goals was carried out on a very small scale in 2006. The Environmental Agency of the Republic of Slovenia has no data on recovery at biogas plants either. Furthermore, there is a notable discrepancy between the quantity of landfilled organic kitchen waste reported by landfill operators and the quantity of deposited organic kitchen waste reported by municipal waste collection and transportation services. In short, the indicator reveals inadequate/unsatisfactory reporting on recovery and other handling of organic kitchen waste. - landfill operators, who submitted their reports on the landfilled organic kitchen waste. The content of each report is examined and, in the event of any discrepancies, verified with each liable entity. The data are entered into the database.